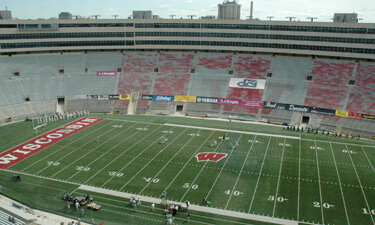 Today marks an exciting return for the Drum Corps International World Championships presented by A.J.Wright to Camp Randall Stadium at the University of Wisconsin in Madison. The stadium has recently undergone quite an overhaul, with many new amenities for the fans. We're opening the week of championship performances with the Division II & III Prelims, featuring 28 corps from the United States, Canada and Holland. Performances start at 10:00 am and will go to just after 7:30 pm. Nine Division III corps will advance to Division III Semifinals on Thursday morning, and nine Division II corps will advance to Division II Semifinals Friday morning. Twelve corps from both classes will perform on Saturday morning and early afternoon in the Division II & III Finals. Of particular interest today is the anticipation of seeing if The Academy can sustain its undefeated season in its first year as a nationally traveling corps. Being that all the above Semifinals and Finals shows will be held in the same stadium as Division I events, immediately preceding those events, it is hoped that many more fans coming in for the Division I performances will take advantage of this unique opportunity to come enjoy the spirited performances by the Division II & III corps. Wednesday will feature a daylong Individual and Ensemble competition at downtown Madison's sparkling new Overture Center for the Arts, where members from all corps will compete on the same level, regardless of their corps' division. Thursday will see 23 corps appear in Division I Quarterfinals, with the DCI Cinema Live broadcast of the final 17 corps being shown in theaters throughout the United States. Friday's Division I Semifinals will feature a performance by the Madison Scouts Alumni Reunion Corps and the annual Age-Out Ceremony, where fans get to thank the performers of all the competing corps for their years of dedicated service to providing entertainment. The Division I Championship Finals will wrap up the season of competition on Saturday night with what is sure to be a nail-biter of an event, being that so many corps are so close to each other in scoring as of late. In all strata of competition, there are races too close to call. Stay tuned to DCI.org for lots of live streaming for Season Pass subscribers (it's not too late to register to enjoy this feature! ), numerous free articles and features and lots of news on this year's DCI World Championship events and news about events in the future. Sign on frequently, as there will lots of material for perusal and enjoyment. We hope to see you throughout the week!